Over the Olympic games, adidas invited the UK’s finest sneaker customer Nash Money to customise adi shoes in the Olympic Park. 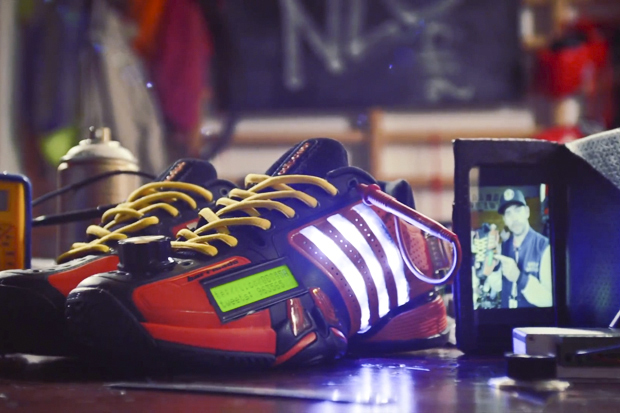 Here we see him turn a pair of adidas Barricade’s into a social media gadget. Never one to go the simple route, Nash has installed a full Twitter system into a pair of Barricade’s. No mean feat at all. The idea was inspired by the amount of social media activity throughout the recent Olympics and how this was really the first Olympics to see athletes and fans interacting directly via Twitter and the like. A unique and modern moment in history that Nash felt was worth symbolising in footwear form, and we agree with him. Installing a small screen on the front of the left shoe, you can tweet to @adidasbarricade and your tweet will appear on the shoe. Supposedly, you will also get a reply, however we are yet to test this ourselves. The concept is an artistic look into the possible future of the 2016 games in Rio. It’s Nash’s way of asking what the next step in athlete-fan social interaction will be and it does get you thinking about how big a part Twitter and social media had to play in the overall popularity and united feeling of London 2012. Check out the video below to see Nash’s description of the shoes and the concept behind them. If you’re unfamiliar with Nash’s work, then why not check out our interview with the man himself for a bit of background reading (our first ever feature in fact). Big ups Alex Nash!.. TY on audio too.. dope.